How many boring Powerpoint presentations have you sat through? Even worse, how many have you given? There is nothing worse than the feeling that you are losing your audience’s attention with every new bullet-point. The solution: focus on the core message and keep it simple! 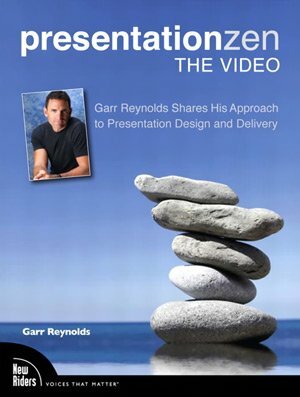 This advice is provided by Garr Reynolds in his book Presentation Zen: Simple Ideas on Presentation Design and Delivery. Peachpit just released a DVD called Presentation Zen: The Video narrated by the author. Garr, a former Apple employee who lives in Japan, boils down the Zen approach into a very entertaining instructional video. Step #1: The Preparation – identify the core message. Garr talks about looking at the topic with “the beginner’s mind” to get a fresh approach. Brain-storm to flesh-out all possible points of discussion. Be messy and thorough. Then, start grouping points and discard the excess. Garr emphasizes to keep the core message at its heart and build the “story” around it with a beginning, middle and end. Remember, he stresses to keep the presentation conversational. Step #2: The Design – amplification through simplification. Here, Garr stresses the Zen principles for design: simplicity, naturalism and elegance. The message must not be lost in the clutter on screen! He covers several examples of bad screens and shows how to improve them. He also covers design tips (like visuals, contrast, alignment, proximity and empty space) which keep the focus on the message. Step #3: The Delivery – keep it natural. Garr stresses that the master presenter focuses on telling the story not his technique. Rehearsing is important, but the delivery must be a natural conversation. He covers several points, most importantly, connecting with your audience and knowing when to stop. Watching the video, you get a sense that Garr really does live what he preaches. He makes what could be a dull topic (giving a presentation about giving a presentation) entertaining and thought-provoking. Both the book and the DVD would be helpful to any presenter. Just be sure to watch the blooper reel at the end of the DVD … it is hilarious!